Staphylococcus epidermidis is a pathogen associated with nosocomial infections whose medical importance has increased due to progressively invasive medical procedures. In this study, we characterized the molecular epidemiology of S. epidermidis strains circulating in our university hospital situated in Kuala Lumpur, Malaysia. A total of 798 S. epidermidis were isolated from our university hospital, where 56.3% of the isolates were found to be cefoxitin (methicillin) resistant and also positive for the mecA gene. Staphylococcus Cassette Chromosome mec (SCCmec) typing revealed that 39.6% of the methicillin-resistant S. epidermidis (MRSE) were SCCmec-untypeable, with 54.6% harboring the cassette chromosome recombinase C (ccrC) gene. A total of 67 isolates from the neonatal intensive care unit (NICU) was selected for pulsed-field gel electrophoresis (PFGE) typing, where 13 pulsotypes were identified at a cut-off value of 80% similarity. No significant association was found between the PFGE pulsotypes, SCCmec types and antibiotic susceptibilities. Polymerase chain reaction (PCR) assays to detect biofilm-associated genes in the ica operon and also 4 staphylococcal toxin genes (cna, seh, PVL genes and tst-1) revealed that only 8.0% isolates had the complete operon, while cna was the most prevalent toxin gene detected amongst the isolates (35.8%). To our knowledge, this is the first report on the molecular epidemiology of Malaysian S. epidermidis. We found the strains to be low in virulence potential; nevertheless further studies have to be conducted to determine if this phenomenon translates into a better clinical outcome for patients. Staphylococcus epidermidis, categorized as coagulase-negative staphylococci (CoNS), are important agents of nosocomial infection as they are human normal flora with abilities to survive in hospital settings and medical devices . Recently, the medical importance of S. epidermidis has continued to rise along with the increase of invasive medical procedures and number of immune-compromised patients . In addition, the phenomenon of drug resistance in multi-drug resistant S. epidermidis (MDRSE) as well as methicillin-resistant S. epidermidis (MRSE) strains, coupled with the ability of the pathogen for biofilm production lead to complications for the treatment and eradication of S. epidermidis infections [1, 2]. Molecular studies have also identified the presence of staphylococcal toxin genes, such as exotoxins, enterotoxins and the toxic shock syndrome toxin (tst-1) in S. epidermidis, elevating the clinical importance of this nosocomial pathogen . As data about the molecular epidemiology of Malaysian CoNS is still lacking and as S. epidermidis is the predominant CoNS species for nosocomial infections [1–3], we initiated a study to characterize the molecular epidemiology of S. epidermidis strains circulating in our university hospital situated in Kuala Lumpur, Malaysia. In 2009, a total of 2354 staphylococci infections were recorded in the hospital. The first isolate of each infection (according to the time and date they were received and registered in the hospital diagnostic laboratory) was collected, colony-purified and stocked as strains. From these strains, 1156 (49.1%) were identified as CoNS via the tube coagulase test, where 798 (69.0%) strains were later determined as S. epidermidis with PCR using species-specific primers and cycling conditions as described previously  . All CoNS infections have been classified as “true” infections and not contaminants by hospital clinical microbiologists via the presence of pus cells in the samples). From medical record review, the S. epidermidis infections were found to have occurred in various wards and clinics of the hospital, including eight surgical (12.5%) and six medical wards (25.8%), the adult and neonatal intensive care units (15.0%), four paediatric wards (4.9%) and also eight outpatient clinics (4.2%). The strains were isolated mainly from blood (38.1%), pus (40.7%), tracheal aspirates (3.0%) and tips (2.6%). The study strains were subsequently tested for their susceptibilities towards various antibiotics using the disk diffusion method (Oxoid Microbiology Products, Thermo Fisher Scientific Inc.) according to Clinical Laboratory Standards Institutes (CLSI) recommendations . More than half (56.3%) of the tested strains were found to be resistant to cefoxitin (1 μg), 81.2% were resistant to penicillin (10 units), while 53.3% were resistant to erythromycin (15 μg). Comparatively, fewer strains were resistant to ciprofloxacin (5 μg) (29.9%), fusidic acid (10 μg) (30.4%), gentamicin (10 μg) (36.0%), mupirocin (5 μg) (24.2%) and rifampicin (5 μg) (12.9%). Interestingly, 1.6% of the strains were resistant to teicoplanin (30 μg); nevertheless, all strains were susceptible to vancomycin (30 μg). Almost half of the strains (48.6%) were multidrug-resistant; the more common drug-resistance combinations were ciprofloxacin-erythromycin-gentamicin-oxacillin resistance (3.9%), ciprofloxacin-erythromycin-fusidic acid-gentamicin-oxacillin resistance (2.5%) and erythromycin-fusidic acid-oxacillin resistance (2.5%). Genomic DNA of each strain was then extracted for molecular studies. Firstly, we proceeded to type the staphylococcus cassette chromosome mec ( SCCmec) of MRSEs using the protocol from Kondo et al. . All MRSEs were found to harbor the mecA gene. However, 39.6% of the MRSE were SCCmec-untypeable; this finding is in line with other reports of high untypeable-SCCmec percentage among MRSEs (30% - 50%) [1, 7]. A total of 9.4 and 7.6% of the tested strains were successfully typed as SCCmec type IV and V, respectively; but only 0.9, 1.6, 1.6, 0.4, 0.9% of the strains were typeable as SCCmec types I, II, III, VI and VIII, respectively (Table 1). A total of 33 new potential SCCmec combinations were found, and 9 out of these 33 combination patterns have been described elsewhere . Interestingly, even though many of the MRSEs were SCCmec-untypeable, a high percentage (54.6%) were found to harbor the cassette chromosome recombinase C (ccrC) gene, either alone or in combination with the other ccr genes, where ccrA2B2 was the frequent combination partner (43.2%) (Table 2). ccrC in SCCmec V was reported to have high transferability among Staphylococcal species and strains . This edge in transferability might be the reason why most S. epidermidis in our hospital harbors the ccrC. High abundance of ccrC might have also driven the mobility of SCCmec elements in our strains, causing the derivement of new and varied SCCmec types in the species. In addition, Katayama et al. reported that ccrA2B2 e lements usually carry macrolide resistance genes; this tallied with our strains’ antibiogram where 53.3% of our CoNS that carried ccrA2B2 were also resistant to erythromycin. As no dominant SCCmec type could be found for our study strains, we attempted to type the strains using Pulsed-Field Gel Electrophoresis (PFGE) to check for a dominant pulsotype in our hospital setting. Due to the large number of S. epidermidis strains available in 2009, only 67 strains from the neonatal intensive care unit (NICU) were selected for PFGE typing, as most of the strains used in this study were isolated from this ward. PFGE was carried out using a protocol as described previously . 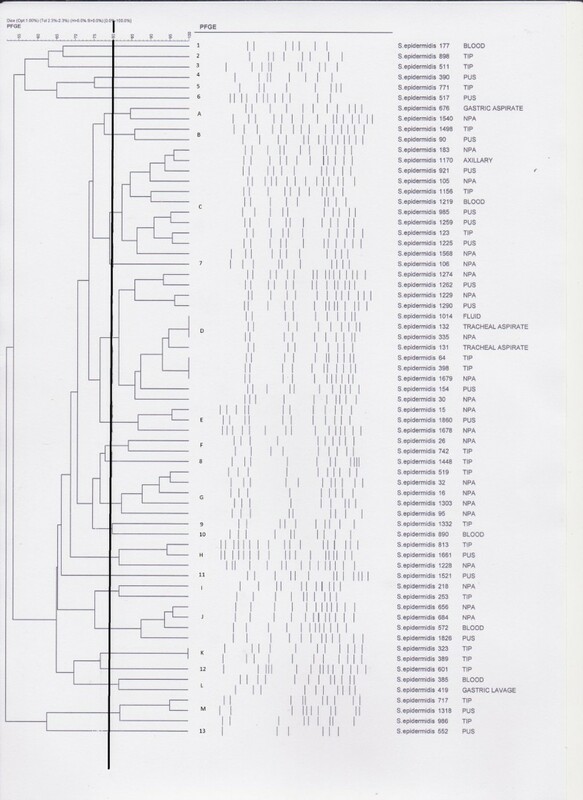 When the isolates were analyzed at 80% similarity cut-off point, a total of 13 pulsotypes and 13 singletons were identified, with the 2 major pulsotypes, C and D, containing 15 and 11 strains, respectively (Figure 1). No significant association was found between the strains’ PFGE pulsotypes, SCCmec types and antibiotic susceptibilities. Pulsed-field gel electrophoresis (PFGE) pulsotypes for 67 S. epidermidis strains isolated from the neonatal intensive care unit (NICU). With a 80% similarity cut-off point, a total of 13 pulsotypes and 13 singletons were identified. Two major pulsotypes, designated as pulsotypes C and D, contained 15 and 11 strains, respectively. Lastly, to better understand the virulence potential of our study strains, we characterized the biofilm-associated ica operon and also determined the presence of 4 staphylococcal toxin genes (cna, seh, PVL genes and tst-1) in these strains, using currently available protocols [2, 10]. Interestingly, only 7.4% of the study isolates did not harbor the ica operon, while 8.0% of the isolates had the complete operon. icaB was the commonly detected ica gene, either singly (12.2%) or in varied combinations with the other ica genes (40.0%). Besides icaA and icaD, icaB is also important for proper biofilm formation, as it codes for a deacetylase which maintains the adhesiveness between bacterial cells and biofilm . On the other hand, we also noted a high abundance (85.1%) of the insertion sequence IS256 in this operon of our isolates, a phenomenon which was more frequently observed in nosocomial S. epidermidis strains compared to commensal strains . As for staphylococcal toxin gene determination, 62.7% of the strains did not carry any of the 4 virulence genes determined, while cna (35.8%) was the most prevalent toxin gene detected in the strains, either singly (19.4%) or in combination with the other toxin genes of tst-1, seh and PVL genes (cna with tst-1, 1.5%; cna with seh, 7.5%; cna with PVL genes, 4.5%; cna with seh and tst-1, 3.0%). To our knowledge, this is the first report about the molecular epidemiology of Malaysian S. epidermidis isolated from a university teaching hospital. The S. epidermidis studied in our investigation had diverse SCCmec elements and were somewhat low in virulence potential in terms of low staphylococcal virulence gene carriage and haboring incomplete ica operons. Nevertheless, it remains to be determined if these findings do translate into a better clinical outcome for the infected patients. This research is supported by UKM Research University Grants UKM-GUP-TKP-08-19-067 and UKM-GUP-2011-308. NA carried out the experiments and drafted the manuscript. HF and HM participated in PCR and PFGE. HM and SH participated in design study, coordination and helped to draft the manuscript. All authors read and approved the final manuscript.